This a great chutney to have with Cheese we supply this to 2 Sandwich manufacturers who produce cheese and Caramelised Carrot Chutney Sandwiches Winner of the ‘Silver Award’ at the Great Taste Awards. To say we are obsessed with this jar of delight in our house is putting it mildly! Fantastic service arrived day after I ordered. The Carrot Chutney is gorgeous and the beetroot one too. Will be back soon to try more. Never seizes to impress! Great served with a sharp mature cheddar or other sharp cheeses. Deliciously sweet without being overpowering. Perfect for the cheeseboard. Can’t stop ordering this, me and the hubby love it so much! just delicious. 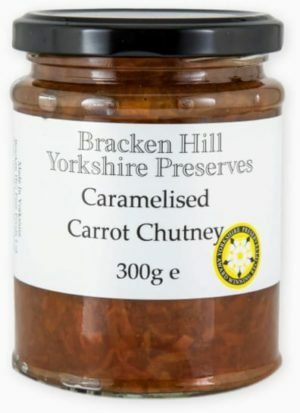 If you’ve tried the M&S Wensleydale with Caramelised Carrot Chutney sandwiches you’ll love this! so glad I managed to find it. Carrots 44%, Onions 22%, Sugar 17%, Wine Vinegar 11%, Balsamic Vinegar 4%, Spices, Corn Starch, Sea Salt.